Back in the summer of 2011 I arrived at the main gate of Seoul National University (SNU), ready to tour the campus that would be my home for the next four years. Naturally I posed for a photo in front of the iconic Sha, with excitement tingling through my toes. Where next? I paused in the sweltering heat; I had absolutely no idea. I still remember that day quite vividly. I remember being lost. I remember my slippers digging into my skin, leaving blisters. I remember being angry at one point, angry with myself for not researching prior to visiting the campus. The problem is, I did not know the one thing you should know before you visit SNU: the campus is large. Large is a soft way of describing it. Surrounded by the Gwanak Mountains, SNU naturally has a hilly terrain that will work your legs to exhaustion. Thus, one must be strategic when visiting SNU. If not, one faces the risk of making one’s first encounter with this impressive campus an experience of irritation and painful blisters. Here is a list of top places to see when visiting Seoul National University. The main gate is a landmark of SNU. Take a photo in front of the iconic structure, which is formed by the Korean characters “ㄱ, ㅅ, ㄷ” that stand for the university’s original complete Korean name: 국립서울대학교 (Seoul National University). 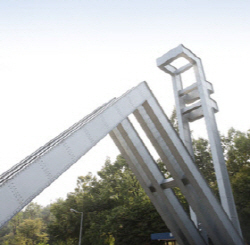 Constructed in 1978, this gate has seen many great individuals emerge from the institution. It has also been a crucial departure for protest movements. In 2011 the SNU Student Council president at the time climbed the gate to express his disagreements with the school’s policy to become autonomous. As you pass this spectacular gate, do so with an understanding of the history it has lived through. After passing the main gate, turn left and cross the streets. The Museum of Art (MoA) will loom ahead. Opened in June of 2006, the MoA is a piece of cultural pride for SNU. 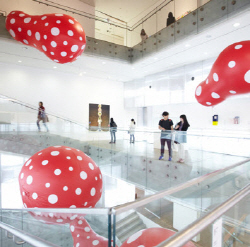 It holds exhibitions of students’ works as well as renowned domestic and international artists. Designed by Dutch architect Rem Koolhaas, the structure of the building itself is a work of art. If you have time in your day’s schedule, pop inside and you can enjoy the exhibition that is being held at a relatively affordable price. They say the inside of the building is even more impressive than the outside. From the Museum of Art, cross the street and walk back down. You can catch a glimpse of SNU’s impressive football field on your right. Keep walking until the outdoor basketball courts, then turn left. Follow this path until you reach the IBK Communication Center (Building 64). You will enter SNU Hall. 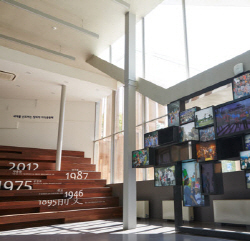 Opened in September of 2014, SNU Hall is a promotion hall that exhibits the history and the future vision of Seoul National University. Learn about the foundation of SNU to its present, or give a moment of silence in front of the wall of remembrance, which honors the noble SNU students who died during the Korean War and the April Revolution. Leave the SNU Hall with a greater understanding of the institution. From the SNU Hall you may walk up past the College of Social Sciences (Building 16) to reach Jaha pond. Located near the College of Humanities, Jaha pond is one of the most beautiful nature spots on campus. The pond was named after the great scholar of the 18th century Shin Wi. Jaha, meaning purple mist, was Shin’s pen name. During the budding warmth that is spring, Jaha pond is sprinkled with flowers and lush green trees envelop the water. Jaha pond is also an adequate place for people watching. Sit near the wooden benches located on the back part of the pond. Under the cool shade of the trees, your mind may travel back to simpler times. On the left of Jaha pond is the take-out café Neuteenamu where students go by for a quick bite or a refreshing drink. Owned by SNU Co-Op, which runs the convenience stores and souvenir shops in SNU, Neuteenamu Café offers a variety of drinks and desserts at affordable prices. An ice Americano, which can typically cost up to 4,000 KRW (nearly four U.S. dollars) at market price, is sold at half the price. The name of the café is also important as it translates to Zelkova tree, SNU’s official symbolic tree. Make sure to get the cream and chocolate waffle, the sengcho waffle, a tasty treat that students love. If your sweet tooth wants something more enticing, try the ice cream in milk coffee, of coffee-sok ice cream. From the Jaha pond area you can see two massive structures in the center of a hill. These buildings are the Central Library and the Kwanjeong Library. The Central Library and the newly opened Kwanjeong Library represent the academic hub of SNU. The Central Library is the older building, where most of the books and documents are located. The newly built Kwanjeong Library is an impressive architectural achievement inside as well as outside. The Student Center is located near the bottom of the libraries and will be easy to spot. Drop by the souvenir shop on the second floor to browse through a variety of trinkets, clothes and school supplies that are most likely marked with the SNU emblem. On the left of the souvenir shop there is a flight of stairs. Walk up and you will see a small sandwich shop next to the pharmacy. If you are hungry from all the exploring around, try the “lounge ball” sandwich. These are inexpensive sandwiches that are stuffed with delicious fillings. My personal favorite is the hogo, a sandwich with orange pumpkin and sweet potato filling. (Trust me, it tastes better than it sounds.) If you are still hungry, walk to the first floor of the Student Center and try the cafeteria food. The nutritious and filling meals range from 1,700 KRW to 4,000 KRW. There is much more to explore in the SNU campus than that which has been listed above. For those starting their first year at SNU, you are lucky to have at least four years to experience all that the university has to offer. For those here on a simple visit, worry not: Seoul National University is always open.